When I heard the news that H&M finally also delivers to Luxembourg, I immediately had to check out their online store. Lately I haven't been shopping much at H&M because I found their clothes to be either a bit boring, or too expensive for high street quality. I nevertheless managed to place an order with some lovely pieces, among them the suede granny shoes which you can see above. I blame it on the free shipping (which is still available until March 15th). 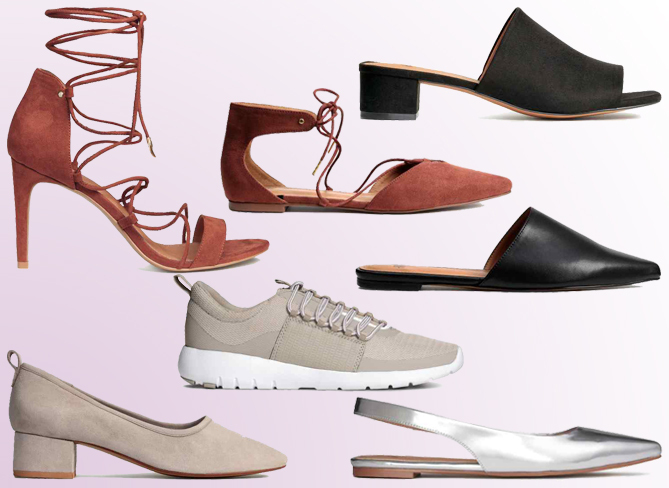 When filling my virtual cart I noticed how many awesome shoes H&M currently has in stock and I could spot all major shoe trends for spring/summer! Besides the granny aka glove heels, there is also the major trend of mules and I really appreciate that they have both a flat and a low heeled version. Although they've already been a huge deal last year we'll obviously also not get around lace up heels and pointed flats this summer. Another word I've been hearing a lot lately is slingbacks and again H&M chose to sell a quite trendy version in metallic. Finally it seems like no must-have-shoe-list is complete without sneakers lately and even though with trainers I like to stick with sports brands such as Nike or Adidas, I must admit that these beige beauties from H&M are definitely worth a consideration. And the best thing is that all of these shoes are budget friendly and can be purchased in one place! What's your favourite shoe trend of spring/summer 2016? Or is there a shoe style that you find particularly repelling? Do you Clean these Beauty Helpers Often Enough?